If Europe is on your bucket list for 2019, you’re in luck! Check out our list of the 7 best budget-friendly European destinations, below. 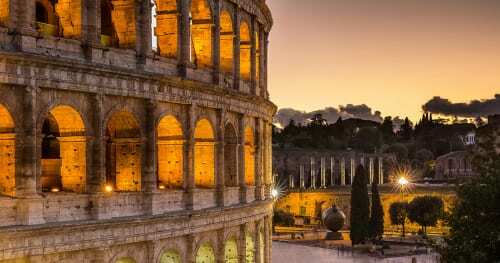 It may surprise you that Rome is so affordable because of it’s popularity. In fact, U.S. News & World Report ranked Rome as the #1 best affordable vacation spot in Europe for 2017. What makes this destination so budget-friendly is the fact that many famous attractions such as the Trevi Fountain and the Roman Forum have free entry! To maximize affordability, skip the busy summer season. This will save you a lot of money on flights and hotel. Despite rising prices due to Prague’s growing popularity, it is still top on our list for budget-friendly European destinations. If the often-brutal winter weather in Prague doesn’t scare you, you can expect to save even more by staying in the colder months. Most popular attractions can be accessed for a cheap entrance fee, plus cheap local eats and drinks can be found in abundance. Thanks to the Turkish Lira coming way down, Istanbul has become a bargain European destination. Here you won’t want to miss the ornate temples, breathtaking cathedrals, and bustling markets. Istanbul is unique as a face-paced and rapidly-changing metropolis, differing from many other areas of Europe in part to the country’s proximity to Asia. Although somewhat difficult to get reach, sticking to a budget is quite doable once you get there! Stick to street food like sandwiches and kabobs, which are as delicious as they are affordable. Accommodations can be expensive, so check out Price of Travel’s Istanbul recommended hotels list bargain hotels in ideal locations. London is new to the budget-friendly travel destination club. The reason we now include it in this list is due to the fact that the currency has dropped after the Brexit vote. This means it is now far cheaper than it has been in several decades (though still can be very pricey if you are not careful!) and as one of the greatest cities in the world, now is the time to see it! With the help of a travel agent, you can find fairly nice hotels in centrally-located areas in the US$200 per night range. Cheap eats are also easy to come by and you can expect to find meals around US$8 in less busy tourist zones such as Westminster or the West End. London won’t stay this cheap for long, so don’t wait to visit! In addition, many of London’s greatest museums (including the British Museum, the National Gallery, and the Tate Modern) don’t charge admission! Another money-saving tip is to invest in an Oyster Card, much like a debit card for public transportation that comes with a much lesser per-ride price on London buses and subways (approximately $3 per ride versus $6 without). A bit cheaper than Madrid and Barcelona, according to Price of Travel, Lisbon is an historic city which sits atop 7 hills overlooking the port. The main contributing factor that lands Lisbon in the budget-travel category is the fierce competition between hotels. Not only are the hostels competitive with price, but also competitive when it comes to service. The majority of these hostels rank very high on various Best Hotels in the World lists. Hotels and foods here are also reasonably priced compared to other European destinations, and even in the lower price range the food and beverages are delicious and the meals are elegant. Although situated in an area of Europe known to be traditionally expensive, Bruges is actually quite affordable. Much like in Lisbon, there are enough hostels to house thousands of budget travelers and backpackers. Be sure to avoid the busy summer months to keep your travel costs down. Many count on Bruges as a chill-out stop on a European tour due to its relative affordability and relaxed atmosphere. This classically beautiful Italian city cannot be missed! It is touted by many (myself included) as their favorite city in Italy, and for good reason. Florence is tucked amid the breathtaking Tuscan hills and is known as the launching point and capital of the Renaissance era. The history-rich city also boasts gorgeous sunsets, amazing food, and almost unimaginable romantic charm. The hotel rates hover around $125 per night, making lodging quite affordable. Save even more by booking a room on the outskirts of town. Dreaming of planning your own Europe vacation but no clue where to get started? At Enchanted Honeymoons Travel, we plan hundreds of bucket list getaways every year. With travel agents who specialize in exactly where you’re looking to go, the planning process is seamless and carefree. Call us today at 402-281-3022 to learn more!